Interview/article published in MAGNET, vol.2 Number 2, Feb/March 1994, Philadelphia! 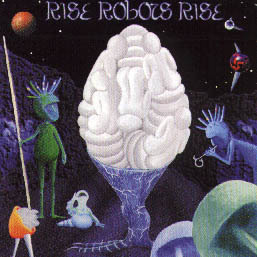 The unclassifiably brilliant Rise Robots Rise returns with its second album on TVT Records, another Osterizer full of bliss and imagination, hooks and funk, guitars and funk, everything and more! The band's self-titled first album generated dozens of rave reviews, each bending over backwards to come up with a comparison, a clever musical link, a triggered emotional response. All in vain and all accurate, for in a musical world where everything's already been said, a new arrangement can become the golden hinge upon which swing the doors of revelation. It looks like a repeat of last year's bittersweet tale: more great reviews, precious little airplay and "soft" sales – in industry parlance. But this should be no surprise: the American public has been so brainwashed into a consuming state of numb acquiescence by years of "Classic Rock" – and its current, officially sanctioned, Seattlooza Alternative – that any slight deviation from the approved model will meet with blank stares. That is, if it's lucky enough to be heard at all by the Claptonite herds out there. Joe Mendelson, guitarist, vocalist and principal Robot with Ben Nitze, puts it succinctly when he acknowledges that RRR's new album, Spawn, "doesn't have a commercial hit song. It doesn't have a really simple, repetitive, catchy tune." 0.K. by me, except that a band with something to say – like RRR – needs a modicum of sales to be able to continue saying it. As Mendelson points out, "The only people able to present their music regardless are legendary people who have been playing a long time or people who have hits!" All right, so write a hit already. RRR albums have so much going on, what with three songs worth of melody and hooks and imagination per tune, you'd think the band could dilute, stretch or otherwise remix one hit out of all that musical wealth. "It's not that easy," Mendelson laments. "If it was, everybody would do it. When you start taking stuff out, simplifying the music, it doesn't make a good pop song. If you leave only the elements that you like, that are 'hooky' or 'catchy,' you don't have much of a song left. Great pop songs are really well-crafted things, they're not just hooks with filler in between them. "Rap has changed the industry," Nitze is quick to point out, "because people have beenI able to get hits by stealing other people's records and adding, 'Jump! Jump! Jump! Jump!' ". "Hey, you guys have got the beat, the rap, the catchy melodies, you're bound to get a hit." Not that the band is obsessed with hits and bullets. They love Frank Zappa and admire the fact he and "many legendary artists who make a living don't have a hit song and we'd like to do it the way some of our heroes have done it," Mendelson muses. "We want to be able to play all over the world, have our own studio, make any kind of music we want. And it doesn't have to be hit pop music." Well, guess what? RRR, sans hit, is doing just that: it's called Fibre. "Fibre is a way of life", Nitze explains. 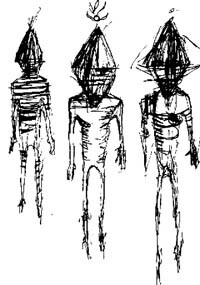 "It's a band first, a quartet, completely experimental, with synths, samplers, Chapman stick, flutes, bells. No guitar, no bass, all live to two tracks, all improvised. People call it 'Knitting Factory Music.' "
Mendelson adds Fibre is also a graphic design firm that produced the artwork for both RRR's LPs and Nitze's other project, Dreamtime (which he calls "an instrumental, mystical jazz ensemble"). One of the band's goals, as Mendelson puts it, "is to get to the point where we can do it all, from start to finish. We have a label, and we know how to make, record, manufacture an album, design the artwork, promote it and market it. "We sample everybody. We're the Robin Hoods of music. We took that from rap." "We openly steal an enormous amount of material," Mendelson adds. "The basis of our songs is all samples, then we write on top of that. It's a shortcut, but you pay for it because it locks you into the machine's parameters and into that sample's harmonic structure: You have to play in that key and in that rhythm, you have to write to that sample. It affects what you write, how you write and your attitude towards the music. It's a heavy concept. Listen to Public Enemy; they've got 10 things all running at the same time that recombine into this new thing. But it doesn't sound like a band. It sounds like samples running. So we have a lot of that, band and samples, we mix the two. And it can get to the point where the two don't mix that well, they're polar opposites." That's the perfectionist musician/technologist speaking, I guess, because to me, RRR is as smooth, as flowing, as innately organic as anything. The band's music may be "very dense, fluid and rich," as Mendelson describes it, but it doesn't conflict with the warmth of the human element. "That's Rise Robots Rise," Mendelson sums up. "We like the concept of examining technology versus humanity."